Traditional quarry tiles are made from natural clays and are generally unglazed; during production anti-slip properties are added to the tiles – which make them perfect for use in heavy traffic and/or wet areas like commercial kitchens. To keep quarry tiles looking great we recommend using a sealer to prevent staining. 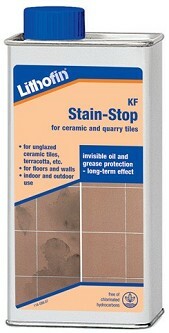 Here at Atlas we would always suggest using Lithofin KF StainStop. This product comes in 3 sizes ( 500ml, 1 Litre & 5 Litres ) and is a ready to use impregnator which has been designed to inhibit water, oil, dirt or grease from penetrating the surface of ceramic and quarry tiles; as well as stain penetration and simplifying daily maintenance. 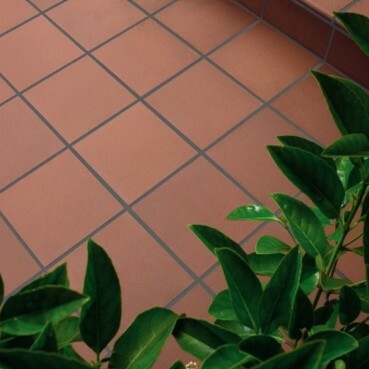 This product is also suitable for use on both interior and exterior tile installations. Stainstop penetrates the surface of the tile and coats the capillaries with a fine, invisible film. Contaminates such as oil and grease are unable to penetrate through this film – leaving these on the surface of the tile. This enables easier cleaning without the worry of your unglazed tiles staining. The effectiveness of this depends wholly on how much of the Stainstop is absorbed by your tiles. Will my tiles change colour if I use a product like this? While I would love to say that your tiles will remain exactly as they are all of the time by applying this product – it is not the case. Generally you will not see any change in the appearance of your tiles – but there is no guarantee – if you do see a change it should only be a slight alteration. How Do I treat the tiles? You will need to ensure that the surface you are looking to treat is completely dry and free from any dust, dirt or debris. Plus if you have underfloor heating – you will need to make sure that this is turned off and that the surface temperature is below 25°C. It is always suggested that you test the product on an inconspicuous area prior to applying across your surface – if you would rather test it on a spare tile then that is fine also. When it comes to application it is recommended that the areas should be treated in sections of 10-15m² approximately. The absorbency of the tile you wish to treat will have an impact on the way your apply the product. If it is of a high absorbency use a brush or roller and avoid using foam where possible. If the surface is a lower absorbency then it is recommended to use a cloth or a brush – whichever method you use – ensure that the product is applied generously, but evenly. After 20 minutes – apply the Stainstop again to ensure that the entire surface is covered. Leave it for a few minutes to absorb into the surface and then remove any surface residue with a cloth. If you are treating a large area -use a squeegee and polishing machine. DO NOT allow the stainstop to dry onto the surface (as it becomes extremely difficult to remove – almost impossible after 6 hours). 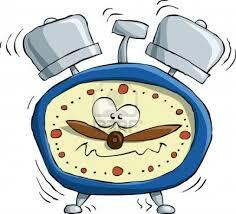 On highly absorbent areas, it may be necessary to apply the solution again after 24 hours. How soon will it be dry? This depends on the absorbancy rate of the tiles that have been treated, but generally most solvents will have evaporated within 2 hours and the product will be fully effective within 48 hours of application. How much will a litre cover? Again this comes down to the tiles that you are applying the solution to and their rate of absorption – making it extremely difficult to give a definite answer. However, it is estimated that on an unglazed quarry tile surface – 1 litre of the Stainstop will cover between 8 and 12m². How often should I re-apply? If the tiles are outside – The durability of the sealer should last up to 5 years, but there is no harm in applying the solution sooner should you notice a deterioration in its effectiveness. If the tiles are inside – the time of re-application solely comes down to whether care products have been used on the tiles to keep them maintained or not. If you are using care products – it is best to stay away from those that contain strong de-greasers or layer forming properties as these will effect the way the stainstop works. For regular maintenance and care – without the worry of layer forming or losing colour from your tiles we would recommend using Easy Care. We hope that we have covered all of your questions – but if there is something that you are still unsure about, please feel free to get in contact with a member of our team will be able to answer any questions or queries that you may have. How To Tile A Step – A Step by Step Guide!